Radio frequency refers to the radio signals that vary from 3 KHz (1 KHz = 10^3 Hertz) to 300 GHz (1 GHz = 10^9 Hertz). In the field of consumer electronics, the area of interest is radio frequency ranging between 10 MHz and 10 GHz. The major components used in RF front communications in consumer electronics devices are mainly Receivers /Transmitters, Filters, Power Amplifiers, Duplexers, Antenna Switches, and Demodulators. With RF developments, products that are enabled with internet protocols embark upon their existence and expansion all over the world. Developed regions such as Japan, China, and U.S had enabled this technology with changed architecture of communication devices five years back but developing nations such as India, Brazil, and South Africa have launched these technologies recently. At present, most of the favorable frequency bands are occupied by cell phones or by government or unlicensed bands with limited transmission range. New devices such as tablets, head up displays, etc. have to rely on less favorable frequency bands, which have more noise distribution then the allotted lower frequencies. 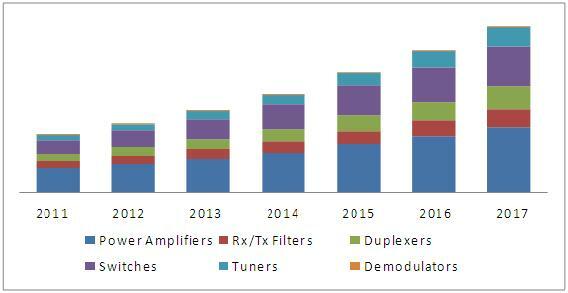 This report refers to the RF components market, which caters to the wide range of applications, components, materials, and modules. RF components cover antenna switches, filters, power amplifiers and tuners; whereas RF components’ application areas cover cellular phones, tablets, e-readers, GPS devices, laptops, smart TV’s, and others. The report also captures the market roadmap with market sizes, trend lines, revenue forecasts, value chain, market & product trends, socio-economic trends and regulations, competitive landscape. Various secondary sources – directories, e-magazines, and research projects, databases such as Factiva, OneSource, Bloomberg, Reuters, and universities blogs were used to identify and collect information useful for this extensive technical and commercial study of the global RF Components market. The primary sources – selected experts from related industries and preferred suppliers - were interviewed to obtain and verify critical information as well as assess future prospects. The key players in the RF Components Market were identified through secondary research while formulating for the industry value chain and their market revenue was determined through primary and secondary research. Major players operating in the RF Components (RFC) market are Skyworks Inc. (U.S.), Murata Manufacturing (Japan), Triquint Semiconductors (U.S.), AVAGO Technologies (U.S.), RDA Microelectronics (China) and RF Micro devices (U.S.). RF Components in correct combinations are the basic components desired by any communication devices for their functioning. Today, with certain technological changes in environment, RF components’ demand is also increasing. The other factor that affects this market is its capability to fit in very small sizes in the mentioned applications. With increasing network of universal mobile telecommunications system (3G), the market has witnessed high demand for switches and tuners due to their supporting feature to provide precise functionality to the other main RF devices such as power amplifiers, demodulators, etc. Scope for massive research and development over the past few years had also helped in the evolution of new technologies according to Moore’s Law. This had introduced different materials such as silicon germanium, gallium arsenide, and others in the past, required for smooth functioning of the communication devices at different specified ranges. Different modules are enabled by embedding the components on a chip known as system-on-chip (SOC). Previously, components used to take more spaces on board. The effectiveness of this can be seen from the current launch of HTC handsets for LTE or the launch of Google TV set top boxes. RF components market for consumer electronics was valued at $5,933 million in 2011 and is expected to reach $17,123 million by 2017 at an estimated CAGR of 19.4% from 2012 to 2017. The demand of RF components is due to the launch of new devices which contains advance features such as virtual communication, haptics reorganization from a distance and so on. Although radio frequencyis a rate of oscillation, the term "radio frequency" or its acronym "RF" are also used as a synonym for radio – i.e. to describe the use of wireless communication, as opposed to communication via an electrical connector. The major players operating in the RF Components (RFC) market are Skyworks Inc. (U.S.), Murata Manufacturing (Japan), Triquint Semiconductors (U.S.), AVAGO Technologies (U.S.), RDA Microelectronics (China) and RF Micro devices (U.S.). 11.1.9 RF MICRO DEVICES INC.